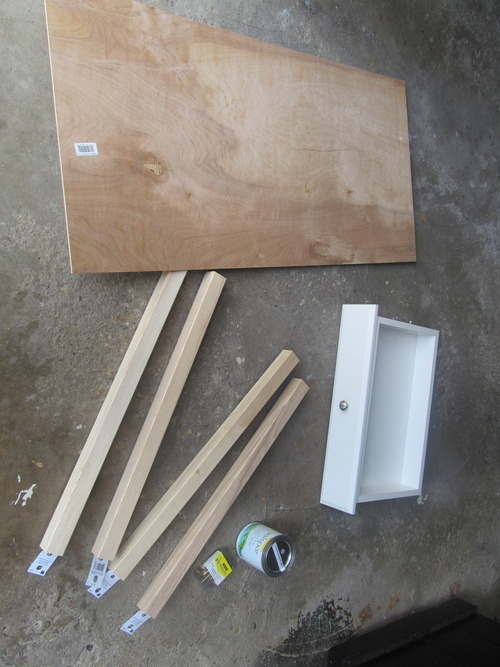 Today I’ll be doing a tutorial on how to make an end table/makeup table out of an old drawer. First, a side note! Everyone meet Aaron. 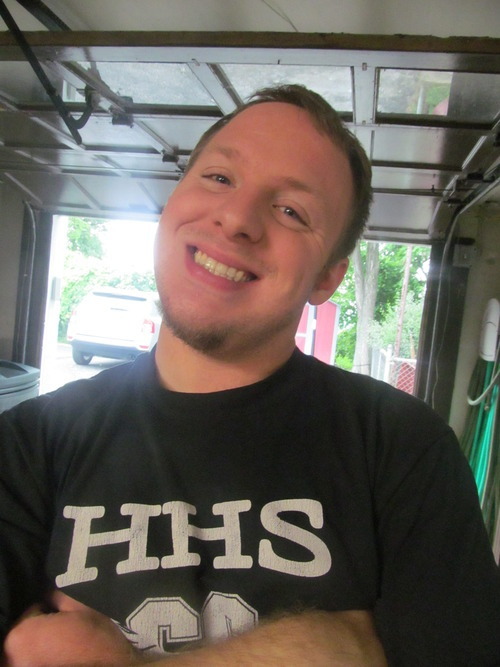 He’s my boyfriend and you’ll be seeing a lot of him because I’ve roped him into helping me with most of these projects. Adorable, isn’t he? A few years ago my mom bought a large storage piece with many drawers but the frame of it broke and we just had several drawers laying around, so I decided to make some things out of them, including a table! 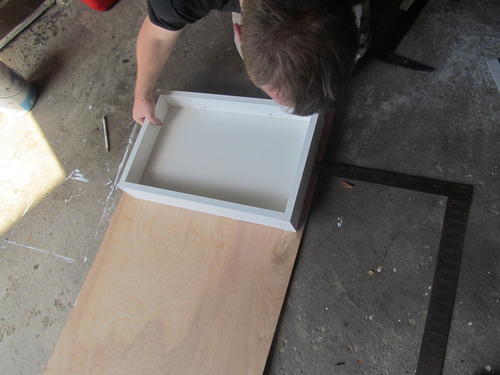 Step 1: Remove the front of the drawer, the wheels and the knobs. If the drawer is laminate, I highly recommend sanding and priming it at this point. Step 2: Lay your flat piece of wood on the dresser and measure out how large you want it to be. Make sure any over hang on the sides are even. I chose not to have too much hanging over my frame, because the piece was so thin. Mark where your drawer will sit on the piece. 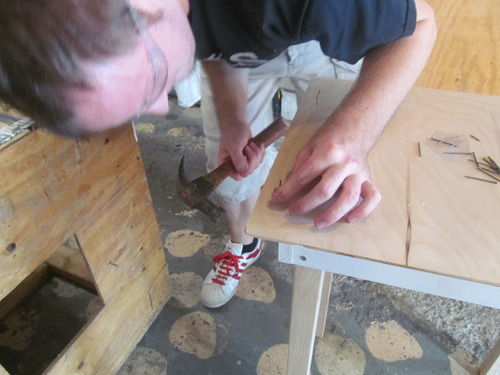 Step 3: Cut where you marked with a table saw! If you’ve never used one before, it’s pretty easy. 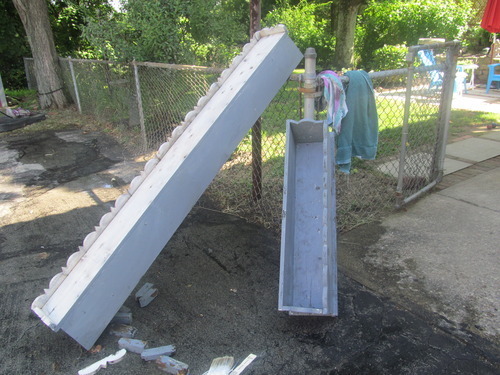 You crank your blade so it sticks up just a little higher than the piece you are cutting. Line up the piece to the blade. Turn it on and push your piece gently along the line, with your hands flat on both sides of your piece, but far away from the blade. 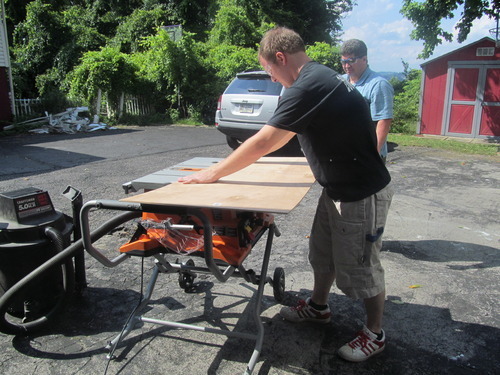 My dad helped out because we were using his saw. After you have your piece cut, sand down the rough edge where you cut and set it aside. 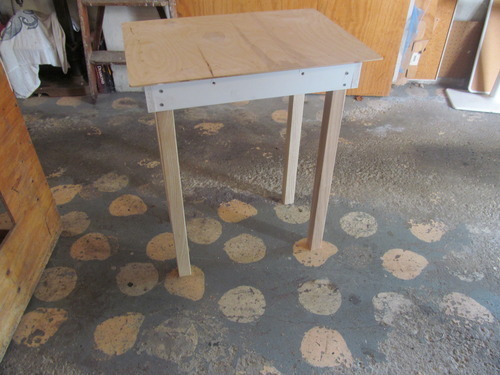 Step 4: Attach your table legs. 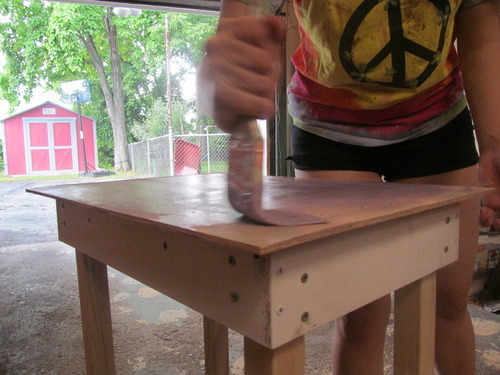 Line up each leg in the corner of the drawer and use your drill to screw in each leg. 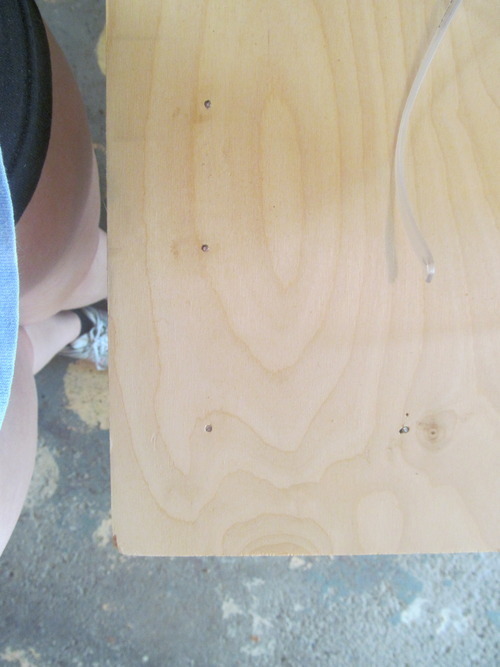 I put two screws on each side, alternating them a little bit so they wouldn’t hit each other. I used a clamp to make them more stable and hold them in place better. After you’ve got all your legs in, turn it over and set it on the ground. You can use a level to make sure it’s not wobbly. If it is, unattach the legs and reattach them so they fit snuggly into the corner of the drawer. Step 5: Time to attach the table top! 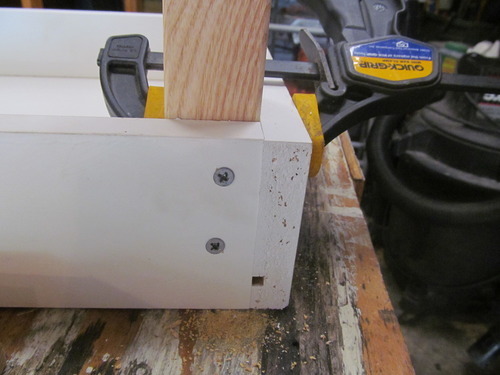 Set your cut piece on top of the drawer where you marked it earlier. Take a hammer and a nail and nail a corner to the drawer underneath. 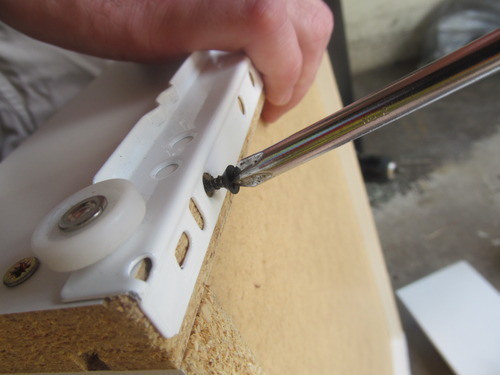 Be sure you are putting in your nail right above the drawer/frame. 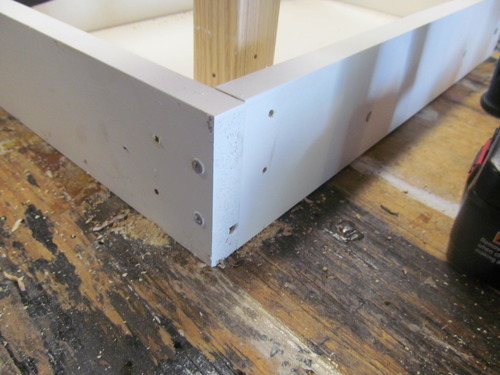 Nail the other corners, then nail around the perimiter of the drawer/frame, about 2.5 inches apart to secure your table top. 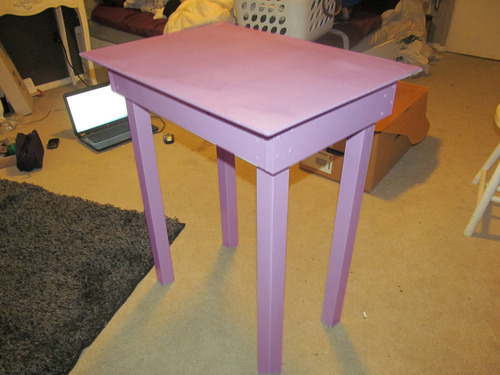 Step 6: Paint it! I used two coats because I didn’t prime my wood pieces. 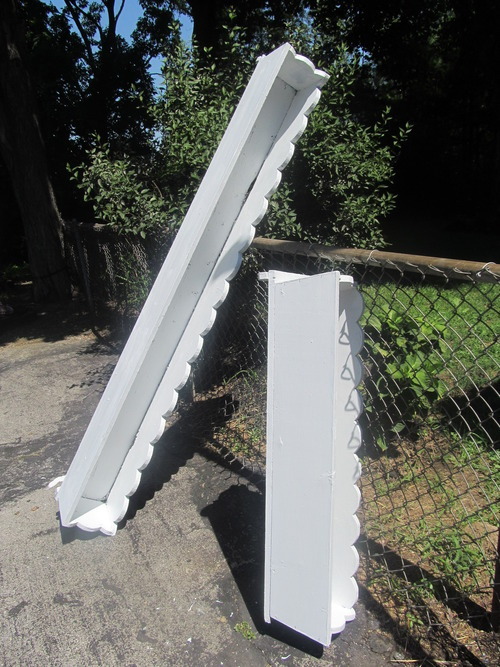 You can use spray paint or regular latex paint. And there you go! I plan on using mine as a vanity for my makeup and putting a mirror above it. Important note about this project: Always wear safety goggles! We had them on while cutting the wood, but not while screwing in the legs. Bad idea! Aaron got sawdust in his eye and almost scratched his cornea. SAFETY GOGGLES!!!! Paint: $15.00!!!! 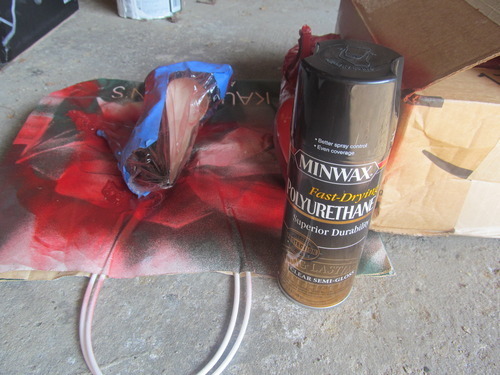 I wanted so badly to buy spray paint but there wasn’t a color I liked and I hate how expensive regular paint was. I only bought a little quart! Screws and nails: Free. My dad already had them in the garage. Total: $57.00 (Would have been so much cheaper with a different paint! 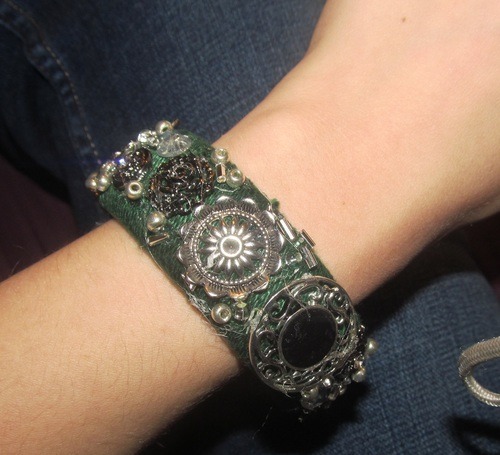 My most recent project was a bracelet inspired by one I saw at Anthropologie a few years ago. I remember it was out of my price range, so I waited until it went on sale, but I waited too long and it went away! So I decided to recreate it for my 75 project challenge! 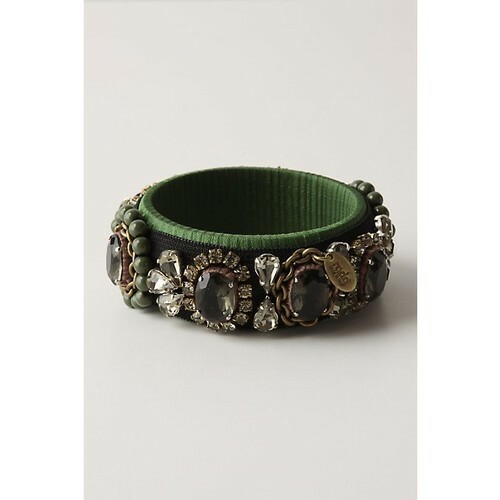 The first step is to wrap your bangle in string. This process was a lot more tedious than I was expecting! 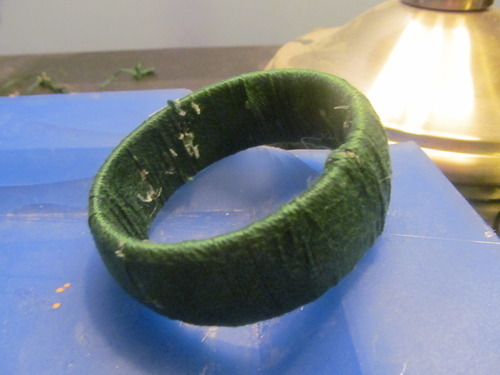 I started by gluing the end of a piece of string to the inside of the bangle. Then a kept wrapping in and wrapping it so it was really tight until I got all the way around. 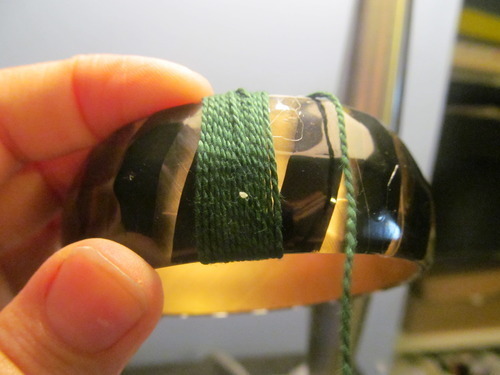 I glued in several places on the inside just to secure the string. 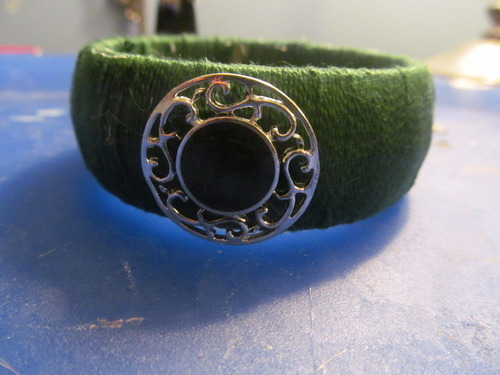 Once your bangle is all wrapped up, it’s time to start adding the beads. 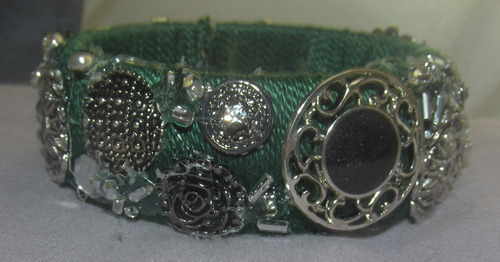 For this step, I decided to glue the gems and things I picked out, but sewing them on is also an option. I love photoshop. I could spend hours sitting on my computer and messing around with pictures to make them look cool and designing new things. I really wanted my blog to look nice and not have a generic Tumblr layout, so I decided to make some graphics to spruce it up a bit! Here is the before with the standard layout and some color changes. Boring! So did some searching around the theme garden and found a variation on this theme by James with room for customizing. Perfect. So I designed a background, a header and a signature on photoshop and uploaded them into the theme and now I have a beautiful blog! The background was inspired by thisfabric. 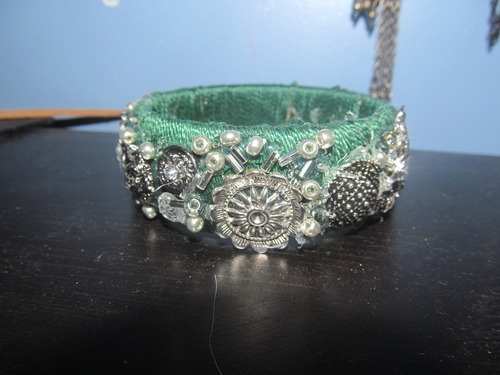 I think the next post/project will be a tutorial inspired by my favorite store, Anthropologie! Stay tuned! Unfortunately, there is a lack of children in my family. I am the youngest of 6 cousins (including my brother) and although they are older and in the “baby having” age range, none of them are ready to have children soon. They are all excelling in their careers and traveling the world and just don’t have time for kids. Understandable and good for them. It does get a little depressing not having any little ones running around at holidays though. No one to play with or take to the zoo or make crafts for. This summer, I was involved in a community theater production and one of the women I became close with in the show is due any day now with a baby boy. I’ve always wanted to make something for a baby and this is really the first opportunity I’ve had since no one in my family is having one anytime soon. 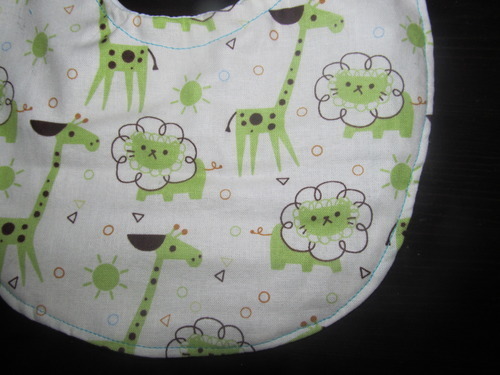 After browsing around the internet looking for inspriation, I found this very simple pattern for a bib over at Purlbee. I found a great fabric over at Hobby Lobby (my new favorite place) and I really love how it turned out! 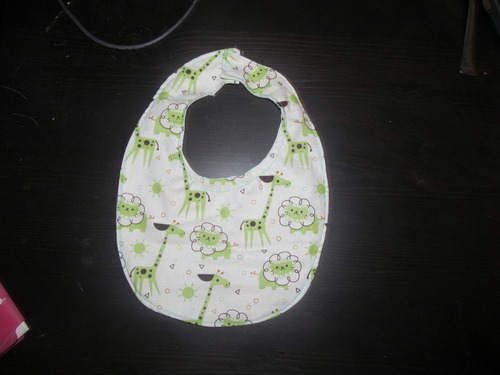 Congrats (in advance) to Sam and her husband and I hope they enjoy the bib! Happy Monday! My most recent project is something I’ve seen floating around Pintrest and various DIY blogs and I’ve been dying to try it. 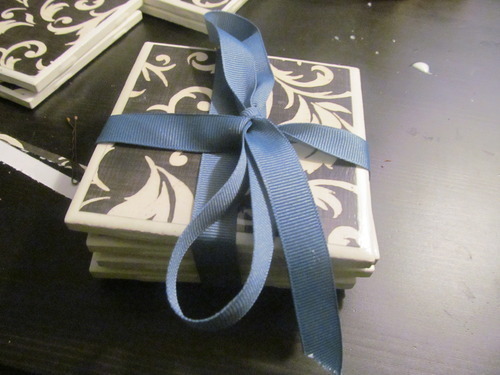 It’s DIY coasters! Next week I’m attending the wedding of my boyfriend’s friend and thought this would make a great gift to go with the wine glasses we bought off their registry. 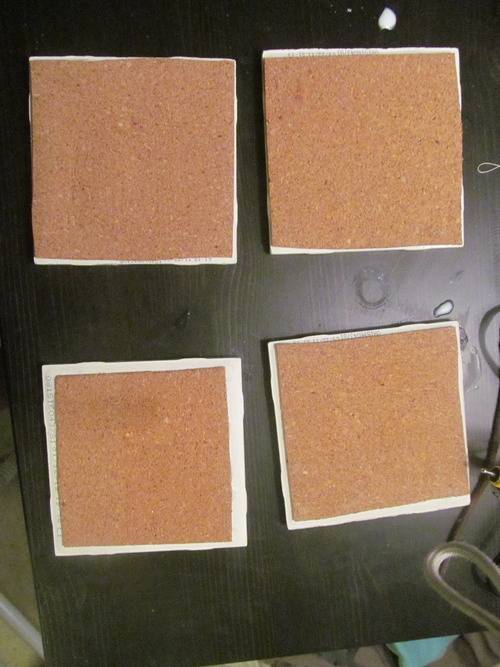 If you want to know how to do these yourself, go on pintrest and search “DIY coasters” and about a billion (okay maybe not that many) links pop up with tutorials. I went with the good old Modpodge and scrapbook paper method, 4x4 subway tiles from Loews and some cork glued on the bottom. Super simple. Super cheap. Super classy. 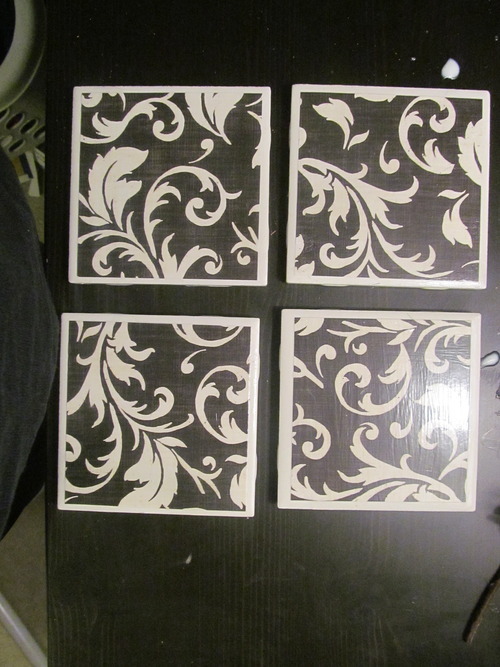 My mom loved these so much, she asked me to make her a set with the left over paper (I ended up getting 8 coasters out of a 12”x12” piece.) So I’m working on those now too. I told my mother I would paint her flower boxes in the summer of 2010. 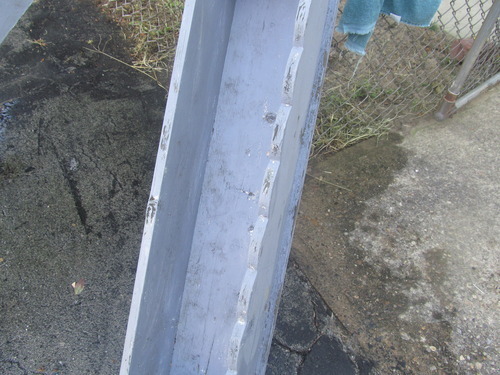 I primed them, then it rained the next day, then two years later I finally got around to painting them. Better late then never? I procrastinated on these mostly because I think they’re a little ugly (sorry mom). The scalloped edges just scream “dated” and “from the 90’s” to me. But, if it’s what my mom likes, then okay. First project of my 75 challange! 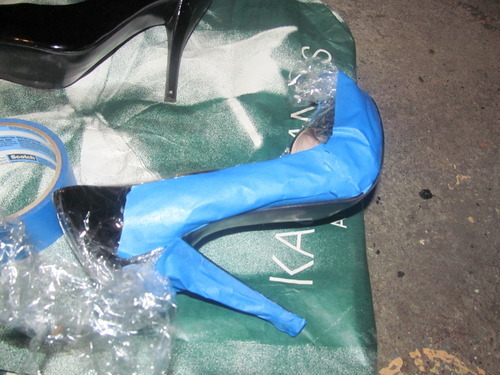 Today I will show you how I made my cheap, black pumps look like expensive Christian Louboutin shoes! Ready? I was watching the hilarious movie The Proposal with my mother and fell in love with the shoes on Sandra Bullock’s feet. I had seen Christian Louboutin shoes before, but didn’t know much about them. After watching the movie, I decided to do some research and fell in love with the Alti Pump on their website. One problem: they cost $945.00! I’m a poor college student! I can’t afford that and even if I could I can think of 100 things more worthy of my spending than a pair of shoes! So I decided to make my own knock off. Here are the materials you’ll need. 1. Pair of black patent leather pumps (or any shoe you choose) I got my at DSW for $60.00. I’m sure you can find much cheaper ones even at Payless or somewhere. 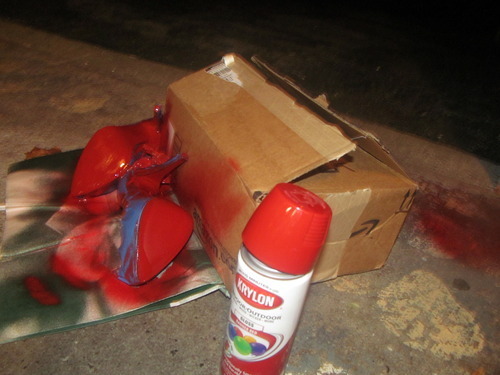 2.Red spray paint. It’s the Christian Louboutin signature, having red on the sole of the shoe. I used Krylon because I’ve heard the best reviews about it. Next I plastic wrapped everywhere I didn’t want to be red and taped down the wrap. I was very very careful around the edges of the soles. I didn’t want any part of the shoe to be red, just the sole! Even with all my care, I still got some red on the shoe. 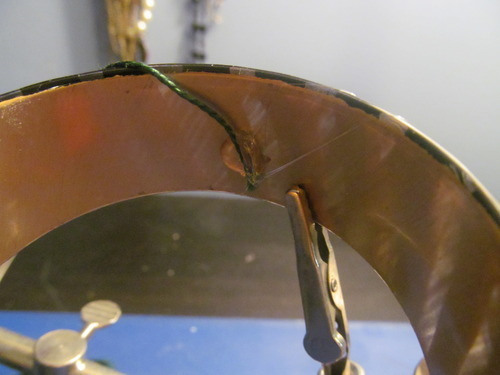 Make sure you don’t let your wrap get too bunched up around the tape edge closest to the sole because that’s how the leaking happened. Keep your wrap a good half inch away from the edge. Make sure your tape is pressed down firmly all the way around the shoe. Next, make sure the sole of your shoe is clean. Wipe it down with a wet rag and then a dry one. I had my pumps for a few months before I decided to do this so they were already a little worn at the bottom. If yours are brand new, I’d recommend scuffing them up with some sand paper or something just a wee little bit so the paint has something to cling to. You’re ready to paint! Prop your shoe up on something that won’t move and you don’t mind getting paint on. Start with a thin layer, holding the can about 7 inches away from the shoe. Try to get in every crevis of where the heel meets the foot. Let dry for a minute. Repeat a few times, leaving a minute to dry in between each coat. After you are satisfied with your paint let it dry for an hour or two. The can says 10 minutes, but I’d give it longer to really let it dry. I decided to start this project very late at night, so I actually let my shoes dry overnight while I was sleeping, but I’m sure an hour or so would have sufficed. Next is sealing the paint. I used a spray can of Polyurethane, but regular or modgepodge should do the trick. 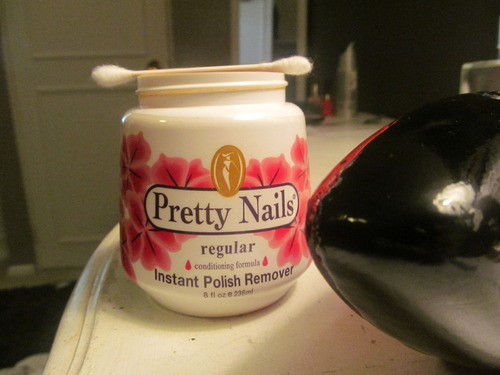 This step is important because if you skip it your paint will just wear off after the first use!!!!! I used the same technique as the paint. Sprayed a thin layer on and let dry for a few minutes. Then I did two more layers. I let the shoes sit for an hour or so before removing the tape. The can of Polyurethane recommended at least 24 hours before use, but I don’t intend to wear the shoes for the next few days, so I should be okay. After they dried a little, I took all my tape off. Overall the result was great. A few places where the wrap got bunchy were sloppy. In order to fix this I took some clear nailpolish and painted over the areas I didn’t want to be red. I let it dry for a minute then took a q-tip dipped in nail polish remover and scrubbed a bit. 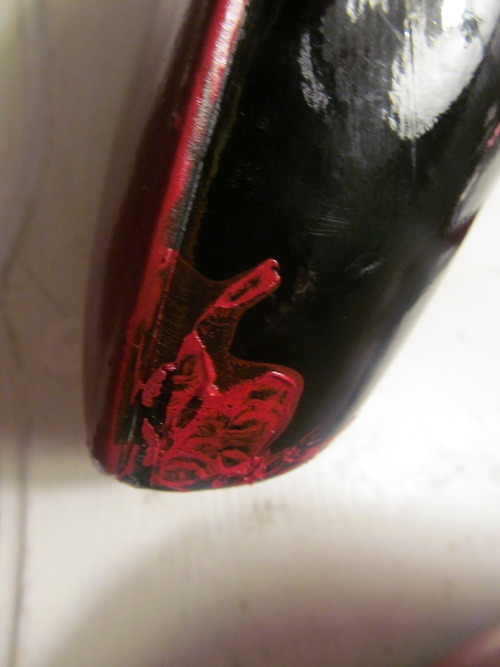 The paint came off perfectly and the patent leather was undamaged! And that’s it! I’m not sure how well they will wear and how quickly the paint will wear off, but I will update this after I wear them a few times! Which means I saved $875.00! This space is where I will document a personal challenge I have issued to myself: 75 DIY projects by December 31! 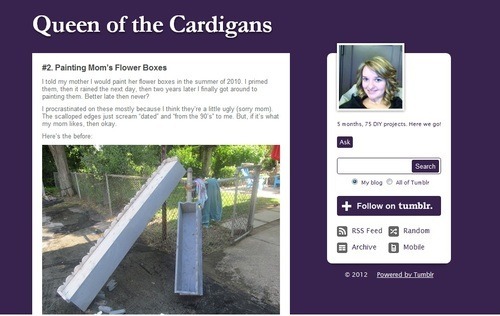 I will be completing projects that include sewing, painting, cleaning, building and others! 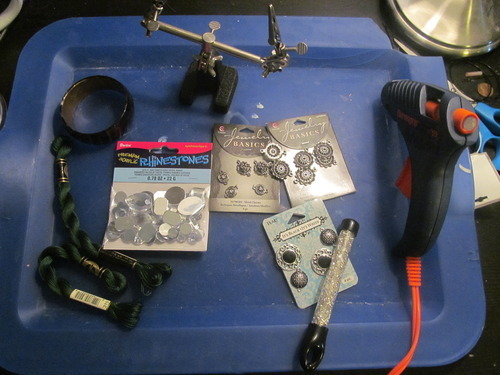 I will have a mix of small and large projects, hopefully with 2 large ones each month. Some I will just post the before and after, some I will post tutorials for as well. I decided to issue myself this challenge because I love crafting and making things, It is my passion. But between school and work I found myself getting frustrated that I was just sitting around and doing nothing in my down time. I wasn’t getting as much as I wanted accomplished. So I set a goal and I’m sticking to it. It’ll be hard at times, but I look forward to it.